Ninety days of open-Bible devotionals with Mark Dever and Mike McKinley. Includes space for journaling. Anchor your soul in unchanging truth with these gospel-centered Explore devotions by Mark Dever and Mike McKinley. Enjoy the beautiful hardback format complete with marker ribbon and space for journaling. These 90 devotionals in Ruth, Jeremiah and 1 Corinthians, taken from the Explore Quarterly range, are a great way to start reading the Bible. If you already spend time each day in God’s word, this book will take you deeper in to the riches of Scripture, drawing you closer to the Lord and gaining fresh appreciation for His love for us in Christ. This devotional material has been an eye opener for me. although at first i was a bit intimidated by the title and bible books it would cover, but i'm glad I did! The daily readings are not too long and what I like most is the questions, application and prayer parts, It lets you dig deeper into the text and smoothly transition you into praying back to God what you have learned about Him and how it changes your believe or attitude. I've seen this book being used with different kinds of group (couples, church workers, individual, small groups) and have only received postive feedback from them too! So I would highly recommend this to any Christian that has a heart to learn more from Gods Word. There is always a summary of the reading of the previous day before we move on to a new reading. This helps to refresh our memory. Answers are provided to every question in the readings as well, thus allowing myself (and other readers I am sure) to end off the reading with better understanding of the verses of that day. This book not only helps me to be consistent in my effort to think about God’s word daily, but also greatly sharpens my understanding of these three books of the Bible. The Applications, Reflections, and Prayer sections help me to put what I have read and learnt from the verses and readings into practice. All in all, this is a great book for daily devotions and I would highly recommend to anyone who wants to start doing their daily devotions but do not know where to start, or those who just want to have a more in depth understanding of these three books of the Bible. We recently started using this for our family devotions and it has transformed them. The questions in the devotionals are simple enough for our 9 year old son to contemplate, but challenging enough to keep my wife and me discussing them after the kids have gone to bed. We typically don't do family devotions on Wednesdays because of our evening services, but my daughter asked the other day if we could start! I cannot speak highly enough about the blessing that this resource has been to our family. 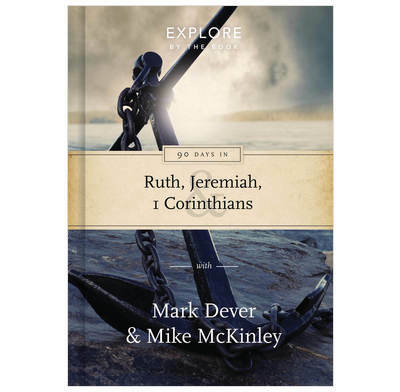 I eagerly awaited my copy of 90 Days in Ruth, Jeremiah and 1 Corinthians by Mark Dever & Mike McKinley. But when I opened the book I was somewhat surprised - I should have used the 'look inside' link first. For a quality book of so many pages I was ready to settle down to some 'meaty' stuff. As a Christian for some 59 years I do admit to being well-read in evangelical theology - and this was probably the reason for my reaction. For those younger in the faith and who might enjoy the question-and-answer format I would seriously recommend this series, but for people like me I would suggest 'buyer beware'. Hello, Sorry that this book didn’t edify you—we’ve found that the Explore format has almost always been well-received by mature, well-read Christians as much as new believers, and that the question-and-answer format helps (/challenges!) people to dig into the Bible text themselves to find fresh nuggets in it. If you’re looking for something a bit less ‘questiony’ and more ‘meaty’, have you tried the ‘God’s Word For You’ range? Many people use those for their devotional reading.